The War Within: Who is the Better Man? As Christians, we have both a new nature in Christ and a sinful nature inherited from Adam, and each one produces works and fruit according to its nature. We have God’s spiritual seed implanted within us at the time of the new birth. This seed is born within us as we are impregnated with the very nature of God. This new birth totally infuses the divine nature into us, and it becomes a part of who we are at the very core of our being. This divine nature, or seed, that God creates within us is everything God is, and it becomes a part of us just as much as the old flesh nature is a part of us. The new spiritual nature continually exerts an influence on us to be like Christ in every way and stirs the heart to walk in holiness and godliness. The new nature encourages and influences our heart to walk in the goodness of God and gives us the energy and strength to do so. Our old sinful nature of the flesh influences us to walk ungodly in selfishness and lustful desires that do not please God. These two natures are in constant conflict and struggle against each other as each one tries to dominate our lives. The sin nature and our new nature in Christ are at war and constantly wage a battle for our heart and the fruit we are to show in our lives. We are always bearing fruit, but we must ask ourselves what nature is producing the fruit in our lives? When we are excelling in good works and doing the things that God has called us to do, then we will be producing the fruit of God’s holy nature within us in our lives. Fruitis something you can see, something you can experience, something that you can observe, something that you can taste, and something you can enjoy. Our goal should be to live our lives in a manner worthy of the Lord and to fully please Him as His beloved children. When we manifest the goodness of God in our works and actions and bear spiritual fruit, we are pleasing to God beyond measure. We bear fruit in every good work that proceeds from our new nature in Christ; this fruit is for the whole world to see and is a glorious witness to Christ. God wants us totally committed to Him, and then we will grow spiritually strong in Him and produce the fruit of that commitment and relationship. The devil through the fleshly nature, wants a total commitment of heart to serve the desires of the sin nature and produce its corresponding fruit. He wants us to continually do works rooted in greed, lust, selfishness, pride, arrogance, hatred, unforgiveness, and hard-heartedness, as this will lead to the producing of evil fruit in our lives. One of the primary characteristics of our sin nature is that it’s self-serving instead of God-serving. It takes the wonderful life that God has given us and misuses it for its own selfish purposes. The inward motive is always the promotion and advancement of self, and thus promotes a rivalry and rebellion against God. One nature glorifies self, and the other nature glorifies God. One nature is rooted in pride, and the other is rooted in humility. One nature promotes evil, and the other nature promotes good. One nature stands opposed to the purposes, plans, and will of God, and the other nature promotes and advances the purposes, designs, and plans of God. One nature promulgates the characteristics and schemes of the devil, and the other nature produces and promulgates the characteristics of God. One nature is incapable of producing good works that please God, and the other nature produces good works that always please God and thrill His heart. The flesh follows the course of this world, and the new nature follows the course of God’s Word. The sinful nature, or the flesh, cannot produce the fruit of the spirit, and neither can the new nature in Christ produce the works of the sin nature. This is the inward war and challenge we face every day: what nature will dominate and lead our lives? We determine by our freedom of will what fruit will shine from our heart and what fruit will dominate our character. not gratify the desires of the sinful nature. each other, so that you do not do what you want. are not free to carry out your good intentions. themselves in for a long drawn-out contest. Do you remember the old war movies when two enemies were in the trenches fighting each other in a fierce battle? Both sides tried to hold their positions in the trenches while waging war against their entrenched enemy. The stakes are high in this spiritual conflict, as this is fierce trench warfare for the control and supremacy of the human heart. This is a battle for the quality and character of the Christian and whether their life will be transformed into the beauty and likeness of Christ or be conformed to the evil and wickedness of their sin nature and the ungodly schemes of this world. This is a battle for what works and what fruit will adorn the Christian’s life and define his witness and testimony for Jesus Christ. This is a battle of eternal consequences, as the future rewards of the kingdom are at stake. The Scottish Covenanters in 1638 were challenged in their faith by King Charles I. King Charles I issued an edict that he was the pope of church, that he was higher than God himself, that was the supreme head of the Church, that he could determine doctrine and theology and what they would believe and he demanded 100 percent allegiance to his throne and crown. The Scottish believers banded together and formed a covenant that said we serve none but king Jesus Christ. We will follow Jesus Christ even unto death. Thousands of the covenanters died for their commitment to Jesus Christ. The passion in them refused to be divided. There are few parallels in history of such undying Christian commitment. This passion for God and His Son Jesus Christ awoke with them in the morning. It followed them like a shadow throughout the day in business or pleasure; it became the breath of their nostrils and the soul of their souls. They knew who the better man was. David was the better man than Saul to be king of all Israel because God chose Him. Jesus Christ is the better man to rule from the throne of our hearts. We see a pattern, a conflict, a war that brews throughout the ages in King Charles 1 and Saul and throughout history of a king that refuses to relinquish his throne, that wants to exercise control and put himself over those under his rule, and than there is this better man which we can call the rightful king. We see this pattern in the flesh versus the spirit. The king like Saul and King Charles says I am not giving up this throne, God says I have taken it from you, I have rejected you, I have a better man for that throne, but they say I am not giving this up!! What about you and me? We have that first king within you and me. We have a King Charles 1 inside of us who wants to be above Jesus Christ; that wants to rule the lands of our life; that wants to do it our way. We have a king Saul inside of us that does not want to give up the throne. There is a covenanter’s voice within that cries out you must yield, there is a greater king that must have rule and authority on the throne of your heart, which must have dominion over our body and the church of Jesus Christ. This is an illustration of the great battle within each of us, the great tension, and the great fight between kings for the throne of our life. This mother of all battles is between the flesh, the sin nature (King Charles 1, Saul) and the spirit (new man, the Christ in us). This battle rages every moment we draw breath upon the earth. The flesh and the spirit are at odds, at enmity, and at war and have been so since the beginning of time. They hate each other and there is a constant warring for position to gain the throne of our heart and rule our lives. I Corinthians 15:45-49 (KJV): 45And so it is written, The first man Adam was made a living soul; the last Adam was made a quickening spirit. 46Howbeit that was not first which is spiritual, but that which is natural; and afterward that which is spiritual. 47The first man is of the earth, earthy; the second man is the Lord from heaven.48As is the earthy, such are they also that are earthy: and as is the heavenly, such are they also that are heavenly. 49And as we have borne the image of the earthy, we shall also bear the image of the heavenly. Romans 8:12,13 (NIV): 12 Therefore, brothers and sisters, we have an obligation—but it is not to the flesh, to live according to it. 13 For if you live according to the flesh, you will die; but if by the Spirit you put to death the misdeeds of the body, you will live. Galatians 6:8: (NIV): 7 Do not be deceived: God cannot be mocked. A man reaps what he sows. 8 Whoever sows to please their flesh, from the flesh will reap destruction; whoever sows to please the Spirit, from the Spirit will reap eternal life. Galatians 4:29: (ESV): 29But just as at that time he who was born according to the flesh persecuted him who was born according to the Spirit, so also it is now. The heart was never meant to be ruled by anyone other than God. This is how we were designed to have God rule our lives. Jesus Christ is to be Lord in our lives. Many of us after we are born again by confessing Him Lord and believing that God raised him from the dead say, “Jesus, I really appreciate all you did for me so I could be saved and have eternal life, but now I want my throne back. I still want to do with my life what I see fit. Go where I want to go. Do what I want to do. Live in any manner the way I want to live. My life is mine and I want to do it my way.” This is unfortunately what happens with more Christians and they wander why their lives are so weak for God; their Christian testimony so failing and the power of God in demonstration in their lives so lacking. We have no right to assume the throne of our lives again after we are born again. You have no right to your life once you are born again. You were bought with a price and your life is 100% God’s. We give up our life for Him with no strings attached. As Christians, we do not have to go through life enslaved to bearing fruit from our sin nature, as its power to be our king was broken and crushed at the cross by Jesus Christ. We do not have to be prisoners of the sin nature, but have been set free from its rule by our Lord Jesus. We can refuse to put our eyes, tongue, ears, hands, feet, mind, and heart into the service of Satan’s kingdom. The power of evil that flows from the depraved and corrupt sin nature that we inherited from Adam has been rendered ineffective and powerless to control us. We must stop letting it raise its ugly head and usurp power in our lives that it simply does not have. We must believe the Scriptures that say that the sin nature is to be counted dead to our words, works, character, and actions. We must recognize that we can stop its fruit bearing and work producing right in its tracks if we develop the habit of resisting it and saying, “NO!” to its desires and urges. God has imparted to us a divine, powerful, and holy new nature in Christ that we can say, “Yes!” to and put all our heart and strength into service of our God and His righteous purposes and will. This new nature will help us immensely in resisting the sin nature, as it gives us the power, the desire, and the will to turn our backs on it and walk by our new life in Christ instead. This new nature is in every cell and fiber of our beings, giving us the ability to be spiritually strong and mighty in our character, in our works, and in our fruit that we bear in our lives. This new nature is the power and the ability to be like Christ, and we can bear the same magnificent fruit that Christ demonstrated in his life in his ministry in the Gospels. We can be absolutely transformed by this new nature into a living representation and example of the Lord Jesus Christ in character and action. The new nature represents the real you and the wonderful new purpose and plan that God has designed for your life. The new nature represents our deepest desires to love and serve God and do something monumental for Him upon the earth that touches humanity and brings His goodness into full display for all to see. The new nature represents the true heart of God, and it infuses us with the ability to grow and develop a godly life that represents all the good characteristics of our heavenly Father. The sin nature will always disappoint, frustrate, and defeat you because it can never make or develop you into the person God has designed you to be. The sin nature cannot make you into a real man or woman with integrity, character, goodness, honor, courage, and strength. The sin nature is a traitor that pretends, that poses, that falsifies, that masquerades, and that fakes, but never delivers a lifestyle of victory, purpose, and success. The sin nature loves to lure, loves to fascinate, loves to enchant, and loves to promise, but in the end leads to a life of bitter disappointment, misery, loneliness, shallowness, emptiness, and ultimately death. The sin nature is rooted and grounded in selfishness, and its nature is to produce thoughts, words, and works of evil. The goodness of God does not reside or exist in our sin nature, and it can never bear any fruit that is truly good by God’s standard. It bears the fruit of frustration, fear, wickedness, and bitterness, because it is rooted in sin and cannot glorify or please God in any way. The sin nature is in permanent revolt and rebellion against God and is hostile to His goodness, His will, and His Word. Education cannot reform the sin nature and bring it to a higher level of consciousness; legislation cannot make the sin nature a better and more just nature; science cannot eradicate the sin nature and eliminate it by pill, vaccine, or surgery. and provided salvation and deliverance into a new way of life and power in Christ. Calvary has given mankind a chance for a new destiny. Jesus Christ delivers all those who come to him into a new life that is birthed within them as seed. Jesus Christ restores those who accept him as Lord into the dignity and honor of an awesome new life, where we can once again become the men and women God has called us to be. We so often want to throw the javelin at our better man, the new man, like Saul threw the javelin at David. We don’t want anyone on our throne but our self. I am made for my throne. But our life will go down the tubes as long as we sit on the throne and won’t let go to the better man. Ephesians 4: 22-24 (KJV): 22That ye put off concerning the former conversation the old man, which is corrupt according to the deceitful lusts;23And be renewed in the spirit of your mind; 24And that ye put on the new man, which after God is created in righteousness and true holiness. Colossians 3:8-11 (KJV): 8But now ye also put off all these; anger, wrath, malice, blasphemy, filthy communication out of your mouth.9Lie not one to another, seeing that ye have put off the old man with his deeds; 10And have put on the new man, which is renewed in knowledge after the image of him that created him:11Where there is neither Greek nor Jew, circumcision nor uncircumcision, Barbarian, Scythian, bond nor free: but Christ is all, and in all. We put off the old man (the old sin nature, the flesh) and put on the new man (the new nature, the Christ within us, the better man). Romans 6:6-11 (KJV): 6Knowing this, that our old man is crucified with him, that the body of sin might be destroyed, that henceforth we should not serve sin. 7For he that is dead is freed from sin. 8Now if we be dead with Christ, we believe that we shall also live with him: 9Knowing that Christ being raised from the dead dieth no more; death hath no more dominion over him.10For in that he died, he died unto sin once: but in that he liveth, he liveth unto God. 11Likewise reckon ye also yourselves to be dead indeed unto sin, but alive unto God through Jesus Christ our Lord. serve it. We must live according to our new nature which is alive to God and His son Jesus Christ. Saul’s son Jonathan was the rightful heir to his throne as king of Israel, but he made a covenant with the better man, David who should have been his greatest enemy. This was treason against Saul, but he was fighting for the future of the better man. Jonathan was sabotaging his own future as an earthly king and ruler. People will say the same of us-“don’t give up your life to this better man Jesus!” You are sabotaging your future. He wants your throne. The better man Jesus Christ is the rightful owner of the throne of your life placed there by God Almighty. The kingdom of your life belongs to God and none other. We have a covenant with God sealed in the blood of Jesus Christ that we have exchanged our life for His. Our eyes, our lips, our feet, our hands are all His and to be put into service for Him. It belongs to God to do with what He sees fit. I Samuel 18:1-4 (KJV):1And it came to pass, when he had made an end of speaking unto Saul, that the soul of Jonathan was knit with the soul of David, and Jonathan loved him as his own soul. 2And Saul took him that day, and would let him go no more home to his father’s house. 3Then Jonathan and David made a covenant, because he loved him as his own soul. 4And Jonathan stripped himself of the robe that was upon him, and gave it to David, and his garments, even to his sword, and to his bow, and to his girdle. 19:4 Then said Jonathan unto David, Whatsoever thy soul desireth, I will even do it for thee. Get the old man off; get the new man on. It is just like putting on a garment. Clothe your self in His work that He has done for you. Clothe your self in His righteousness. To put on His garment, we have to take off our garment, our old man. We are wearing in the old man garment a life all about you-your dreams, desires, ambitions, passions that serve you- your King Charles 1 ambitions must die. II Corinthians 5:21- For he hath made him to be sin for us, who knew no sin; that we might be made the righteousness of God in him. 1. The Robe-understood in scripture as authority, name, position and reputation. 2. The Garments-possession and inheritance. All you have and everything you possess not only now but in the future. 3. Sword and Bow-protection, preservation, watchful eye of defense. Become the defenders of truth, protectors of the weak, the watchful guardians of our heart. 4. Girdle/Belt-Enabling power, quickening strength. Belt where get drive and gusto. Exchange in communion-communion is a covenant meal. Not just remembrance of what Jesus Christ did with the great healing and forgiveness of sins in communion. It is also a remembrance of covenant. It is also an affirming of covenant. Your body broken, Jesus, I accept it as my own. Your body was broken for me and I become your body and your work in me. And in exchange I become your body. Now my body belongs to you; it was purchased; it was bought with a price. My body will now become the temple, the haven, the residence of the most High God and you fill me and do with this body what you see fit; take it anywhere you want to take it; say with it want you want to say; make it do anything you want it to do; for I am in covenant with you. Take my body for it is yours. The cup symbolizes the blood for forgiveness of sins but also symbolizes life. It is a reaffirming of the fact that we have received his life. His life is our only hope and we have no life outside of it. His life is eternal; His life is everything we need. I receive your life and in response I give you my own. My blood, my life belongs to Jesus Christ and he can do with it what he sees fit. Remember he is our lord, the better man for the throne of our life. He asks for every bit, nook and cranny of your life. Not just on Sundays; not just at church but every moment of the day he wants your life. He gave up everything for you!! In exchange we give up our lives for Him. Do you want life more than abundantly? Then you enter into covenant with Jesus Christ. This is how you find your life. He asks for our robe-our position, our authority, our name in exchange for His. Will you give up your reputation? Are you willing to be deemed a fanatic and a fool and an idiot? Or do you want to look good in the eyes of this world only? Will you surrender your name and allow it to be swallowed up in His name? No longer will anything be about you, but your life from this day forward will be about Him and His glory. Will you give up position, fame and worldly authority in order to become royalty in His kingdom? He asks for our garments-our earthly possessions and our corruptible garments in exchange for the eternal treasure of the kingdom. Will you relinquish everything you possess for him? We wrestle over giving everything to Him because we do not trust our God. God has called the better man. Will you give up the applause of men? The security of financial ability? Even the comforts of a self-indulgent existence? Will you give Him your health? Your wealth? Your every material thing to do with as He sees fit? Willing to obey Him whatever He leads you to do. He asks for our sword and bow-our human defense in exchange for His Almighty defense. Will you let down your defenses and allow Him to remodel your life? Will you allow Him to discipline you? Convict you? Transform you into something this world will reject, revile, and crucify? Will you surrender to Him your self-preservation in exchange for His preservation of your existence on planet earth? Will you allow Him to use your life to fight His battles rather than your own self –aggrandizing battles? He asks for our belt-our ability to perform in exchange for His enabling power and quickening grace. We run out of steam, energy, we run out of all we need to carry our life with any consistency. The well runs dry without God. It is a broken cistern that cannot hold water. Will you allow Him to break you? Will you surrender to Him your self-derived strength, so that he might replace it with His own heavenly version of world-altering power? Will you give Him the privilege of keeping you dependent so that He might prove His might in and through your life? Will you allow Him the privilege of showcasing His glory to this world through your existence? He Asks for Everything-Not just 10 percent. But Remember…He Gives us Everything that Could Possibly Matter in Return. We have the inheritance of heaven. We have endless, limitless supplies of God and the promises whether it be love, faith, joy, patience, kindness, peace, the fullness of who He is; there is no barrier between you and the depth of who He is; all the riches that He possesses are you ours and we are complaining about what He asks of us? Yes He asks for everything, but yes He gives you everything He has and everything He is in return. Do you want to be tormented? Live the life of Saul. He was tormented day in and day out because He was sitting on a throne that did not belong to Him. Those who stand against the lordship of Jesus Christ in their lives will find themselves tormented day in and day out. Not wise way to live. There is a better man for that throne. We must die to self to truly live. Jonathan had everything, but he took off his robe. Will we? He gave up everything. Jonathan was in succession to inherit a kingdom. He delighted and loved the better man David and gave up his throne. Let our confession be like Jonathan: Whatever God desires us to do we will gladly do for Him. A. W. Tozer, in God’s Pursuit of Man, says, “He does not distribute Himself that each may have a part, but to each one He gives all of Himself as fully as if there were no others.” All of Christ’s love, all of Christ’s heart, all of Christ’s strength, all of Christ’s compassion, all of Christ’s ability, all of Christ’s peace, all of Christ’s humility, and all of Christ’s power are a part of the poetic masterpiece of the new nature that God has created within us. He has given Himself fully and without measure to each one of us in the Body of Christ. No one has been left out. No one is lacking. There is a war within you for the throne of your life. The flesh and the spirit are at constant war and enmity for control of your life. We will fail miserably if we try to rule our own lives and desires. There is a better man for the throne of our heart. Christ truly is the better man and our heart and life is in covenant with him! Let’s have the commitment of the Scottish covenanters and swear eternal allegiance to the better man. Christ is our life; Christ is our truth; Christ is our way and in Him we will accomplish our eternal destiny. Matthew 16:24,25 (KJV): Then said Jesus unto his disciples, If any man will come after me, let him deny himself, and take up his cross, and follow me. This is the only way you will ever find your true life is by finding the better man Christ and losing, denying and giving up your life for him. Every day, every thought, every action, and every word you will be in this constant war. 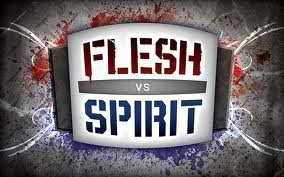 Do I serve the flesh or the spirit? Do I serve the old or new man? Do I serve self or Christ? What garment am I going to put on today? Do I seek to preserve and follow my desires and ambitions or Christ’s? Don’t you want to find your life? Don’t you want to find life more abundantly? Don’t you want to be the better man or woman? Now is the time to win the war within by finding the better man! This entry was posted in Bible Teachings, Inspirational Messages and tagged christ in you, covenant, crucified with christ, david, david the better man, die to self, dying to self, flesh, FLESH VS. SPIRIT; put off old man, ishmael and abraham, jacob and esau, jacob esau, Jesus Christ, new life in christ, new nature, put on new man, saul, saul and david, spirit, the war within-who is the better man, walking by spirit. Bookmark the permalink.